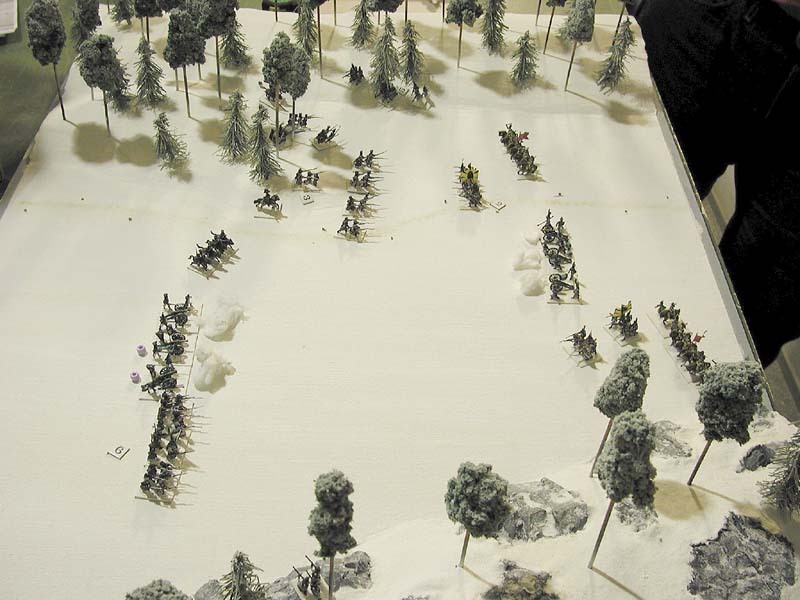 This is a report of the refight we staged on the exact 200th anniversary of the battle. 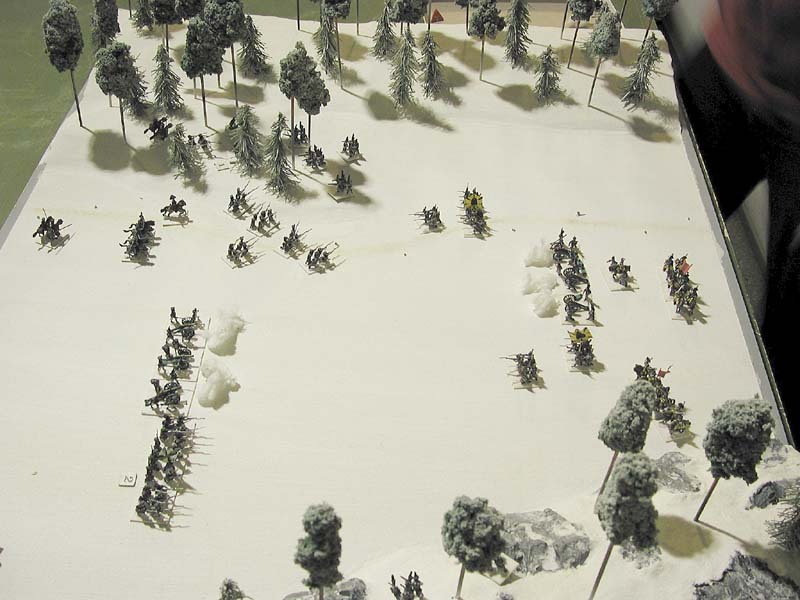 General de Brigade scenario details are on the battle description page. 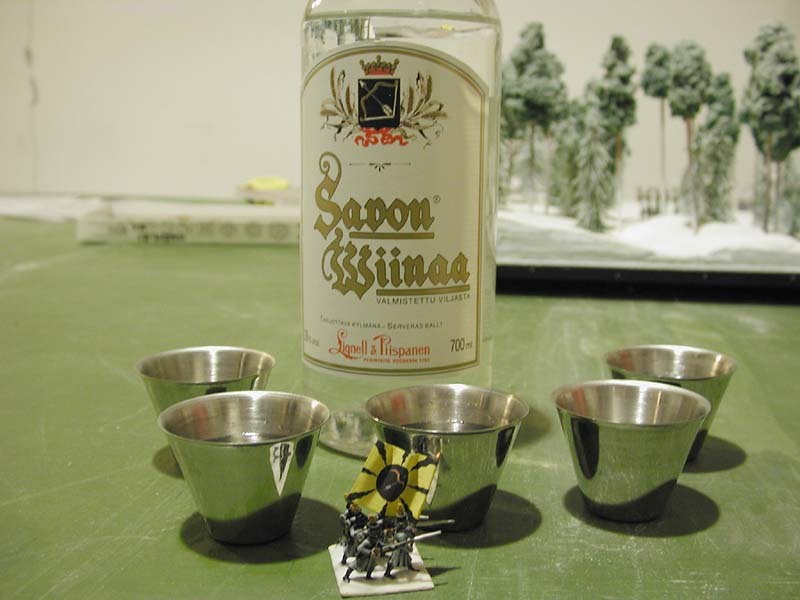 We started the game by toasting to the participants and naturally used Savon Wiina (Liquer of Savo) as the Finnish brigade in the battle was Savo-Karelian brigade. 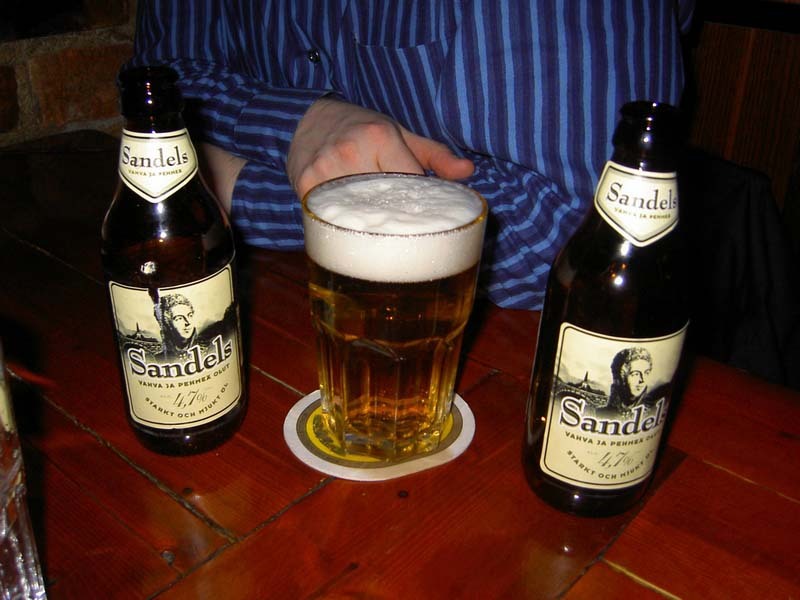 You can clearly see the coat of arms of Savo featured in the etiquette of the bottle as well as the flag of the unit. Kippis! The initial setup, Russian are closer to the camera. 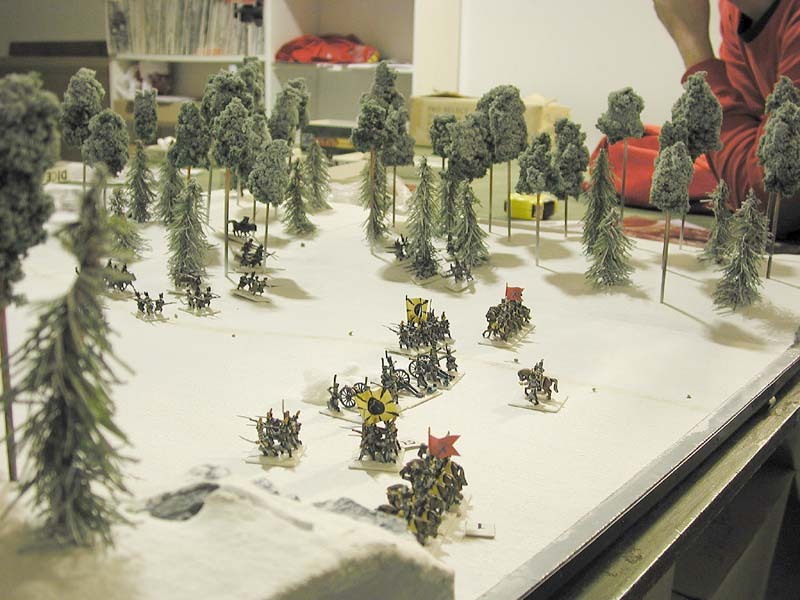 The Russian vanguard, having run across Finnish rearguard some 5 km before Leppävirta, had after some fighting decided that a small road in the middle of a snowy forest was certainly not a good palce to fight a battle and hence they decided to advance via frozen ice instead. Even though Finns had recieved a report about the Russian vanguard, the arrival of the same troops via the lake took Cronstedt by surprise. 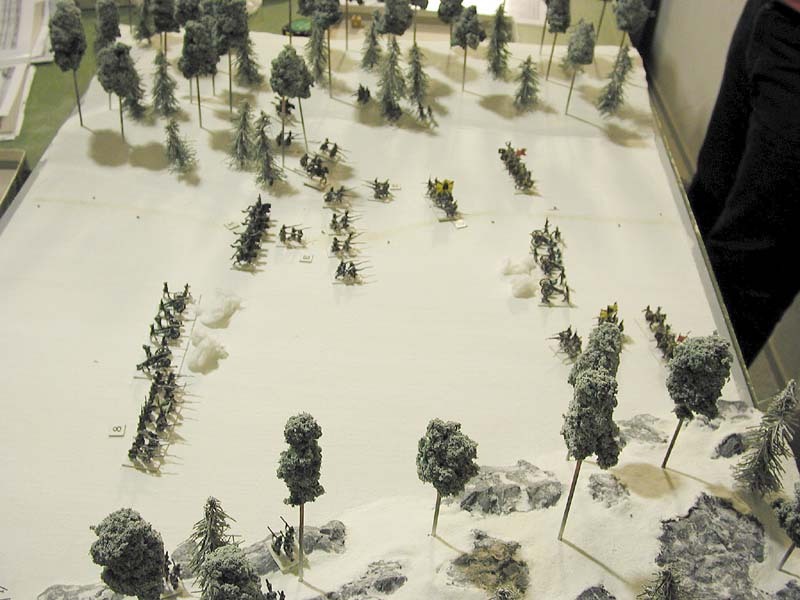 Troops had to be scrambled to the frozen lake in quite a hurry from the houses that they were quartered and some of the troops were located quite far away. Cronstedt also assumed that, instead of the very same vanguard, this was totally different Russian unit. The Finnish main line with the only integral artillery unit in Swedish forces, Savo brigade’s artillery company, in the middle. The unit was equipped with 3 pounders as well as some nigh useless 2 pounder michaques (similar to naval falconets). 1st turn Russians immediately deploy the 24th jaegers as skirmishers and also seem to be massing their cavalry towards their left flank. Their line also advances somewhat dragging along in the deep snow (which lessens the movement by 1d6, to the minimum movement of 2). On Finnish side Savo jaegers advance towards the enemy on both flanks and the Karelian dragoon squadron on the right flank forms a column to left. 2nd turn Russians concentrate their skirmishers against the Savo jaegers on their left flank. 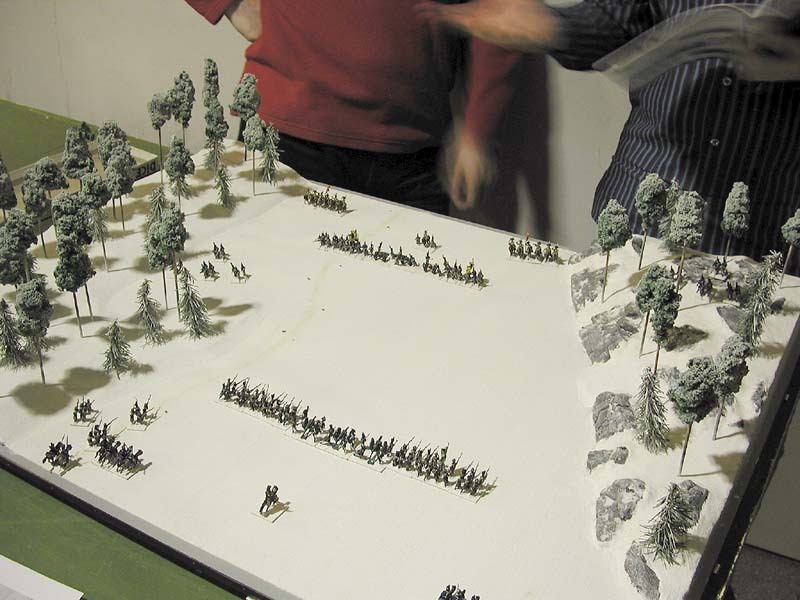 On their left flank Finns deploy the half battalion of Savo infantry into skirmish order (= grandes bandes -all infantry on both sides can do this as otherwise fighting in Finnish terrain would be nigh impossible!) And on their right flank they advance with the other half battalion of Savo infantry that also detatches the combined jaeger platoons of the two line half battalions. 3rd turn Counting their much higher numbers to overbear their Finnish counterparts all Russian jaegers charge. Savo jaegers bravely decide to hold their ground instead of evading. 3rd round closeup Rumble in the forest! The Russian jaegers overpower Savo jaegers on their left flank, give them a bloody nose and send them retreating, but not rounting! 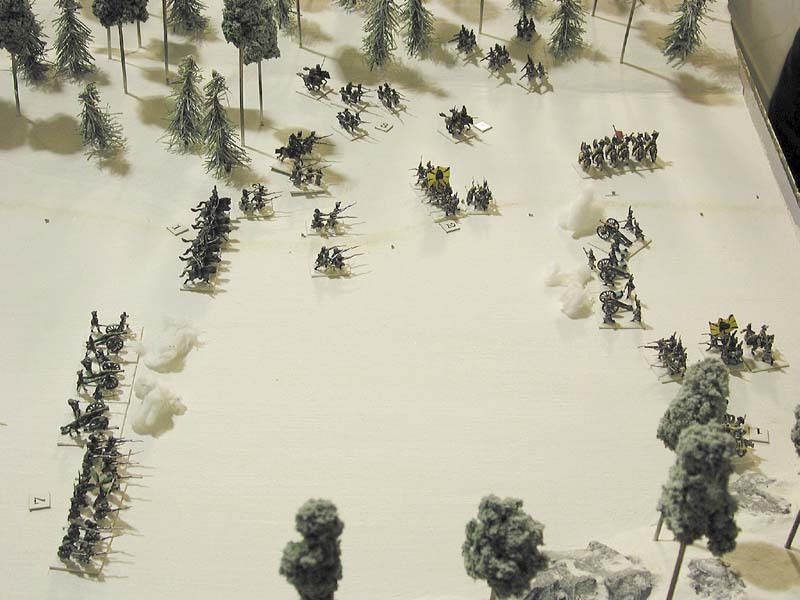 During the fighting a stray bullet kills the Russian general’s horse but his colheadedness just impresses the troops. 4th turn The Russians occupy the cape from which they drove the enemy jaegers away. The retreating Savo jaegers are behind Chris’ hand but what’s even more unfortunate is that their retreat turns into a rout! 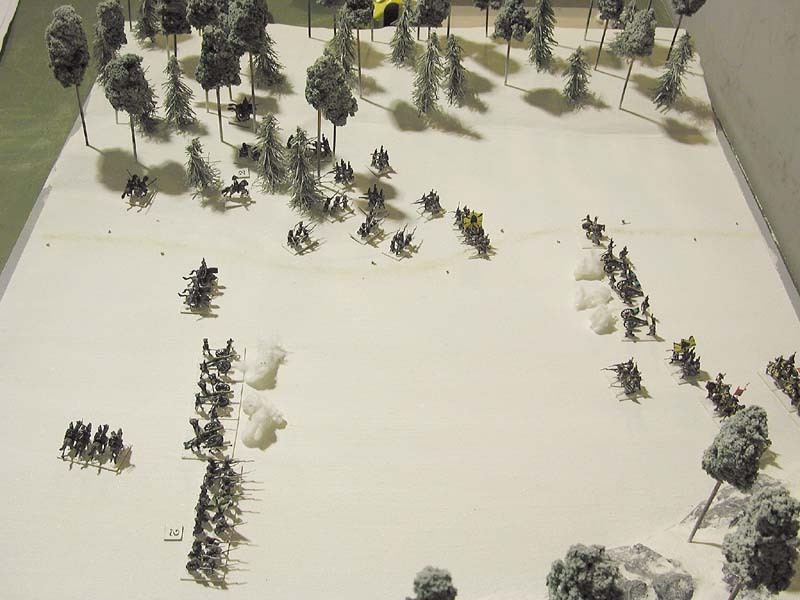 0n the other flank the combined effect of continual Savo jaeger sniping and Finnish artillery fire start showing effect on the Sievsk musketeers. 5th turn The Russians quickly exploit the situation and threaten the flanks of the Savo infantry battalion which ever so slowly starts creeping back towards own lines. Unfortunately the Russian jaegers aren’t that keen on engaging line infantry. Further down in the woods major Tawast manages to rally his routing Savo jaegers just prior to they flee the battlefield. 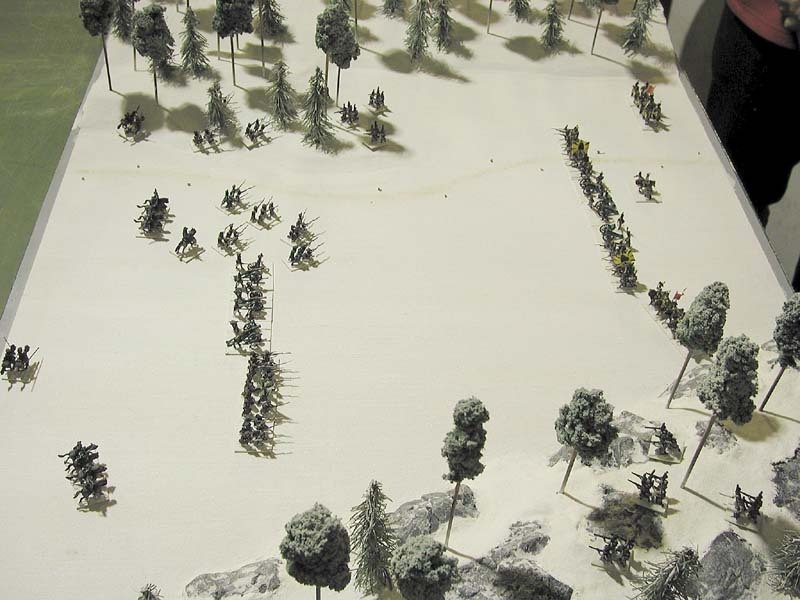 6th turn Tutschkoff tries to decide the battle by leading his cossacks to threaten the flanks of the Finnish artillery and the rear of the infantry. 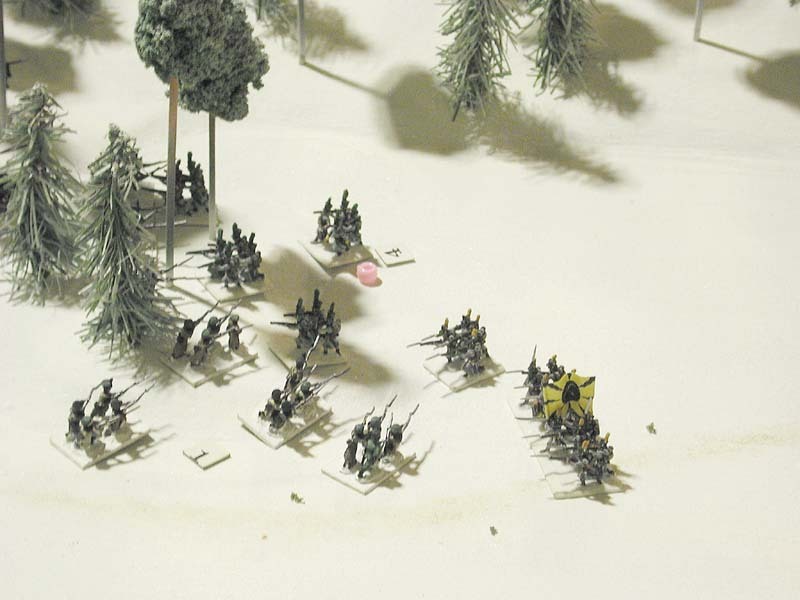 Cronstedt counters this by having the artillery to refuse the flank until Karelian dragoon squadron arrives to help. 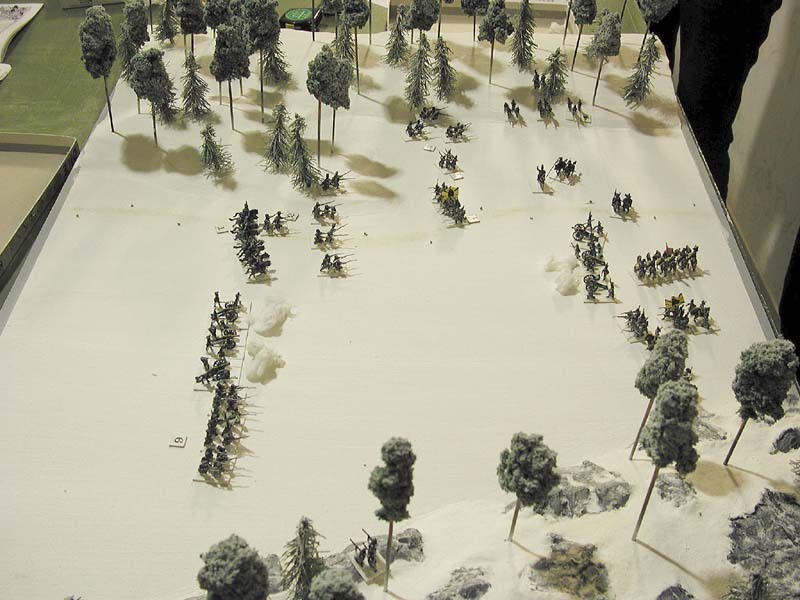 Further down the ice the Russian hussars are in a tight spot, as if the charge the Savo infantry half battalion they’d be exposing themselves to canister fire as well as the first salvo of the regiment they are charging. This would most likely result in too high casualties for just two squadrons, so they hold their ground hoping for a suitable lucky opening. 7th turn The tide turns! 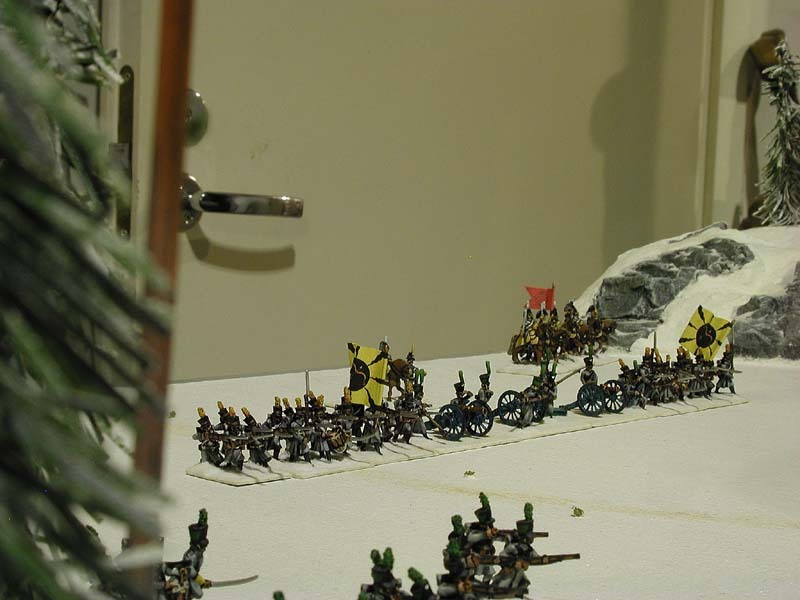 Karelian dragoons charge the cossacks and since each unit is just a half sotnia strong, both decide to evade instead of trying to prove their mettle against opponents of superior numbers and quality. This creates a solid firing opportunity for infantry and especially Savo artillery who give the closer cossacks a whiff of canister. This is like shooting fish in a barrel and the remainder of the unit decides to flee the battlefield. 8th turn Having lostthe initiative of the battle Russians start giving ground in good order in their left flank. 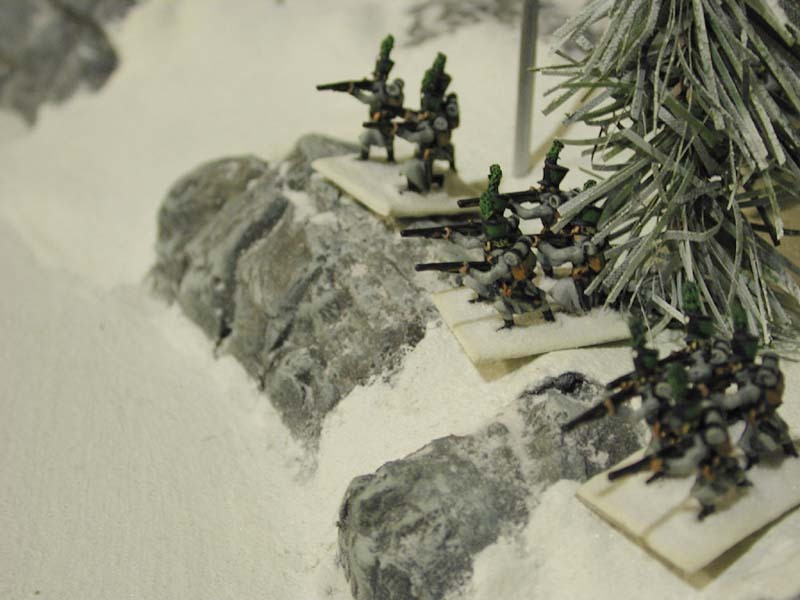 But they also show that they still pack some punch, as the jaegers of the Savo infantry battalions are lost. 9th turn The Russian artillery has performed rather sub-standardly and now it becomes obvious why so: two thirds of their guns are now low on ammo. Barring a miracle, this basically decided the battle. 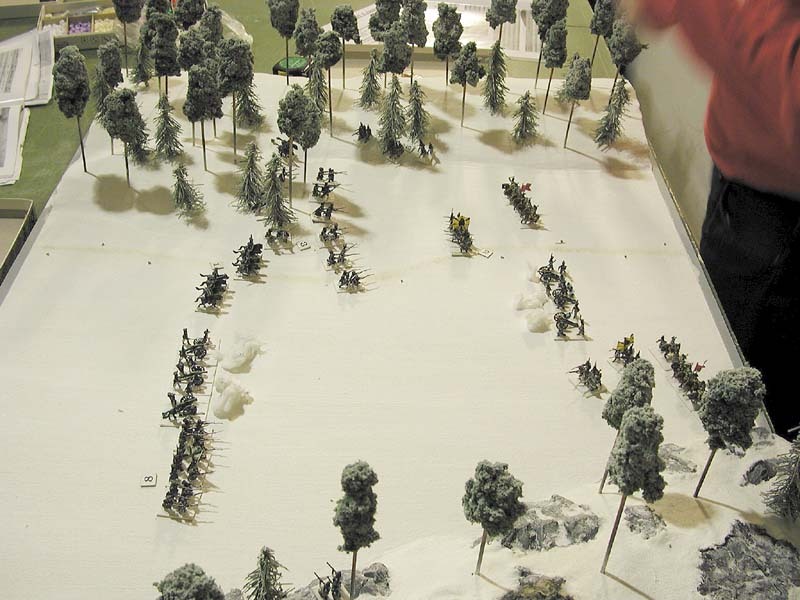 10th turn If their Russian counterparts show sign of quieting down, the Savo artillery company just keeps on pounding and inflicts more casualties on a hussar squardon that had already taken casualties. 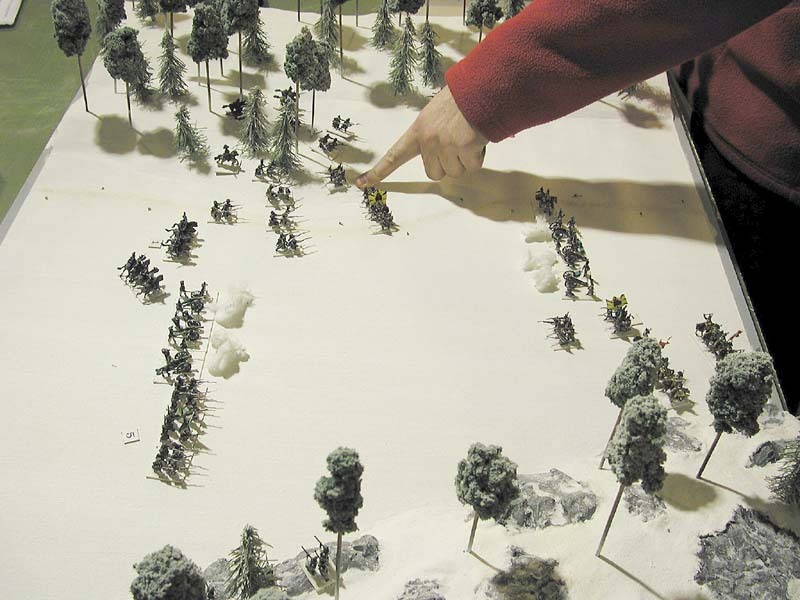 The remainder of squadron decides to relocate itself outside the battlefield. 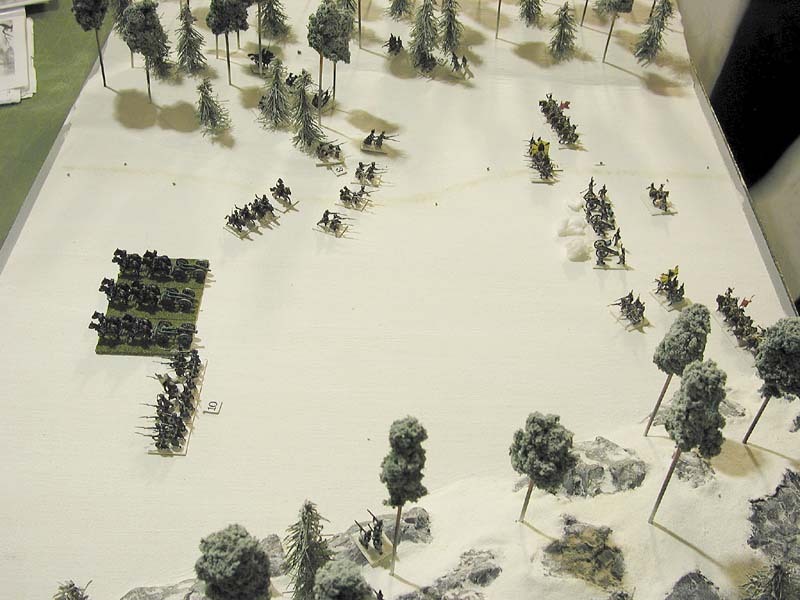 11th turn The Russians decide to quit the battlefield while still somewhat intact. The artillery limbers up an the Sievsk musketeer battallion does an about turn and prepares to march away from the battlefield in dignity. Unfortunately the pesky Savo jaegers in the woods keep on firing at them and the continual losses have slowly grated enough of the unit to finally break their morale so the rest of the battalion flee the battlefield. The victorious Finns boot the Russians out of the Lake Unnukkavesi. The pesky IV Savo jaegers lurk in the cliffy shores of eastern bank. The cliffs were done in plaster with Woodland Scenics’ moulds and were imbedded to the shores. They were used to create the impression of cliffy shore which is hard to traverse rather than an exact replica of the battlefield. Nevermind a stingy defeat or a radiant victory, a gentleman is still always a good sport. 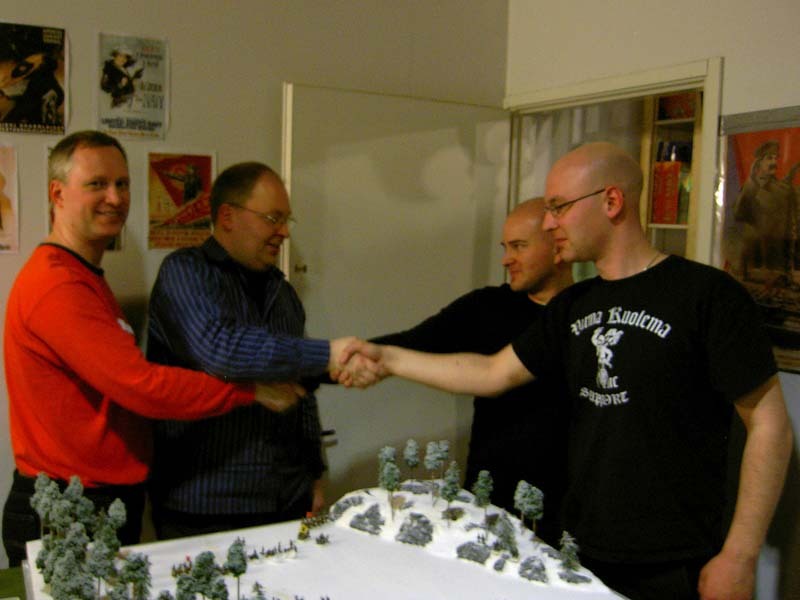 Finnish victors Christopher T. and Petri V. shake hands with Russian players Antti H. and Janne N.
After action review was conducted in the pub upstairs of our club and refreshments naturally consisted of the smooth Sandels beer, named after perhaps the most able of Swedish commanders during the war. At the time of this battle he was the overall commander of Savo jaeger regiment but was given command of all the units that were sent to Savo during the later offensive. The authorative multi-volume Sverigets krig 1808 och 1809 (Sweden’s War 1808 and 1809) gives 5 wounded as the total Finnish casualties in Leppävirta. The Russian casualties are grouped together with battle for Jynkkä and Toivala (March 15th) and consist of 8 captured, 37 wounded and 15 dead for a total losses of 60 men. Total Finnish losses for the same period are 13, 18 and 8 for a grand total of 39. Hugo Schulman in his book Taistelu Suomesta (Battle for Finland) also says that the Finnish casualties was 5 men, but also mentions the loss of 4 horses. 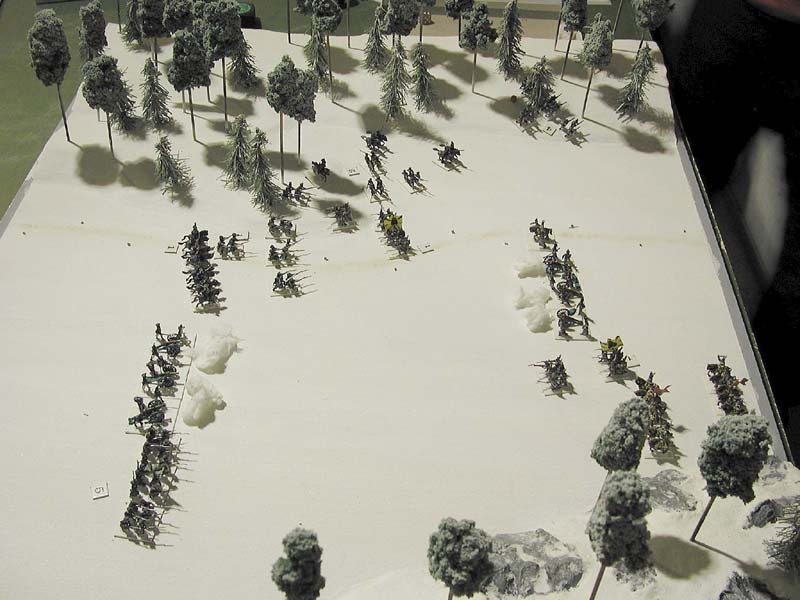 He also meantions the troops hurried to the battlefield “through deep drifts of snow”.